When the world went to war in 1914 the Wright Brothers had only made the world's first powered flight little over a decade before. But the remarkable advances made in aviation during World War One are still at the core of air power today, says Dr Peter Gray. To say the first aeroplanes used in WW1 were extremely basic is something of an understatement. Cockpits were open and instruments were rudimentary. There were no navigational aids and pilots had to rely on whatever maps could be found. A school atlas or a roadmap if necessary. Getting lost was commonplace and landing in a field to ask directions was not unusual, as was flying alongside railway lines hoping to read station names on the platforms. But throughout the war there was a spiral of technological developments, as first one side and then the other gained the ascendancy. To this day the core roles of air power - control of the air, strike, reconnaissance and mobility - have their roots in the evolution of aviation before and during WW1. From the deployment of Tornadoes to RAF Akrotiri in Cyprus to conduct operations against Islamic State in Iraq, to providing combat air patrols over the recent Nato summit in Wales. Aviation evolved rapidly during WW1, with modern and more effective aircraft replacing the basic machines that took to the skies in 1914. Dr Peter Gray explores how the aeroplane turned into a machine of war in a free online course (MOOC) from the BBC and the University of Birmingham Centre for War Studies. 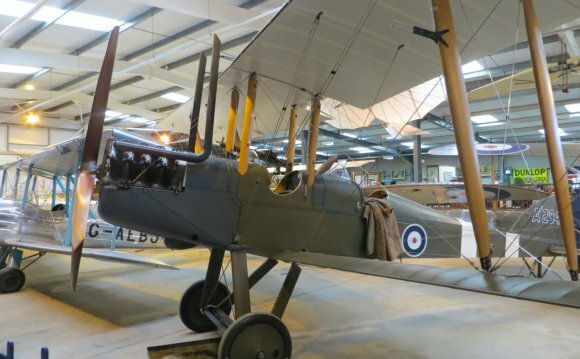 For the British it all started on 13 August 1914 at 08:20, when Lieutenant H D Harvey-Kelly landed the first Royal Flying Corps (RFC) aircraft to deploy in WW1 at Amiens in northern France.